From 1990 to 2010, the triangle offense (also known as the ‘Triple Post Offense’) was by far the most dominant offense in basketball. During this time, the Chicago Bulls and Los Angeles Lakers used the triangle offense to captured 11 NBA championships. Some of the greatest players to ever step on the court thrived in the triangle offense including Michael Jordan, Scottie Pippen, Kobe Bryant, and Shaquille O’Neal, and Pau Gasol to name a few. One might say that the reason the triangle offense is so effective is because it had the above players running it. I wouldn’t disagree with that, but no one can argue that this offense is very effective at putting players in great positions for them to score the basketball. What is the Triangle Offense? The triangle offense is a continuity basketball offense that combines perfect spacing with a series of actions based on player decisions resulting in a beautiful basketball offensive system. It is best utilized by players with a high basketball IQ and great basketball fundamentals. 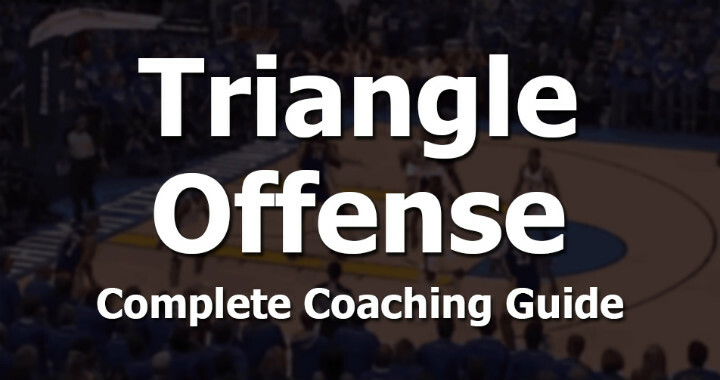 There are an endless number of potential actions out of the triangle offense (far too many to cover in this guide) which is what makes it such a deadly offense. It can be customized to take advantage of the strengths of the team as a whole and the strengths of the individual players. Unlike set plays where there are pre-determined decisions and actions, the triangle offense relies on the players reading the defense and making the best basketball play depending on the options available. Where Did the Triangle Offense Originate? While Tex Winter‘s name springs to mind for many when discussing the origins of the triangle offense, it was actually Sam Barry at the University of Southern California who designed the original offensive system that would later become the triangle offense. Tex Winter was one of Sam Barry’s players and believed in the offense so much that he would later expand and improve the system while coaching various roles at universities including Kansas State University and Marquette University. In 1985, and after many more years of coaching college basketball and perfecting the offense, Tex Winter accepted an assistant coaching role with the Chicago Bulls where he would eventually team up with Phil Jackson to install the triangle offense on a Bulls team that was in desperate need of a team-focused offense. A total of 11 NBA championships. 6 with the Chicago Bulls and 5 with the Los Angeles Lakers. Positionless Offense – In the triangle offense all 5 positions are interchangeable. While the center typically fills the low post position for a majority of the time, they can be rotated out of the post. This is incredibly important for developing well-rounded players. Continuity Offense – The triangle offense can be run continuously until an open scoring opportunity presents. This is unlike set plays that have a predetermined finishing point where if the offense didn’t get a good shot, they now must improvise without structure. Develops Basketball IQ – As players are required to read the defense throughout the offensive possession and make decisions based on the other players on the court, this is a great offense for developing basketball IQ further. Involves All Players – The triangle offense doesn’t allow any one player to dominate the basketball for a majority of the possession. The basketball must be passed around and all players are involved in the offense at all times even if they’re not in possession of the basketball. Requires High Basketball IQ Players – While this offense will develop basketball IQ better than most other offenses, it does require a decent amount of basketball IQ from the start to be successful as the offense relies on quickly reading the defense and making the correct basketball play. Players Must Memorize the Offense – This is one of the main reasons I don’t recommend the triangle offense for youth teams. There are a lot of actions to memorize. Every single decision made by a player on offense results in a series of specific next actions. All players must have these memorized by heart for the offense to consistently be successful. Requires a High Level of Fundamentals – There are certain cuts and passes throughout the triangle offense which require a high level of fundamentals to be done successfully. If your players can’t fake before cuts and passes, don’t have the ability to change speed and direction, and can’t attack the defense 1-on-1, the triangle offense might not be best for your team. You’re Handing Control to the Players – I’ve listed this in disadvantages because I feel that’s the way most coaches will feel when first implementing the offense. Understand that by running the triangle offense the coach will no longer have full control of the offense. The players must read the difference and make decisions. It takes a strong-minded coach to be comfortable with this. Who Should Run the Triangle Offense? The triangle has the highest chance of working successfully with well-rounded, high-IQ players who are willing to share the basketball. I do not recommend this offense for youth basketball due to the experience necessary to make the correct passing decisions and read the defense. Though I have watched youth teams that could definitely be successful using the triangle offense. I do highly recommend the triangle offense for the high school level and up. If you’ve got players who were raised on development-focused teams and have great basketball fundamentals, the triangle offense can be very effective way to further develop their basketball skills and IQ. To be more specific, It can be difficult for teams to be successful with the triangle offense without a low post player who can both score and pass at a high level since so much of the offense is run through the post. When the offense is set up after an entry, the offense consists of a 3-man triangle on the ball-side of the court known as the ‘Sideline Triangle’, and 2 players on the weak side of the court set up in the ‘2-Man Game’. These 5 spots on the court are the main positions within the triangle offense structure and must be filled whenever the triangle offense is set up. Position #1 – Corner – The ‘corner’ is located in the ball-side corner. This will most often be the point guard and should have a good ability to shoot the basketball and create shots off the dribble. 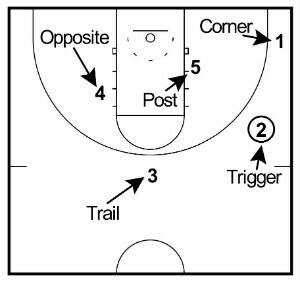 Position #2 – Trigger – The trigger is located on the wing and will usually possess the basketball after an entry. The passing option that they make from this position will dictate the entire offense so it’s important to put a smart player in this position. Position #3 – Post – The post is located on the high side of the low block and should be positioned directly between the trigger and the basket (line of deployment). The high positioning allows players to cut above and below with space. The post player is preferably a good passer and can also finish in the post in a one-on-one situation. Position #4 – Trail – The trail is located at the top of the key when the team has entered into the offense. This player is most likely the other guard and should be able to hit the outside shot as well as cut and create off the dribble. Position #5 – Opposite – The opposite player is located approximately a step off the weakside mid-post. This player is likely the other post player but should be capable of interchanging with all positions on the floor. The ‘Line of Deployment’ is a concept of the triangle offense that all players must understand in order to take advantage of the post and make the correct passing decisions when initiating the offense. The ‘Line of Deployment’ is the straight line between the trigger, low post player, and the basket. The logic behind this concept is that as long as the trigger (2), the low post (5), and the basket form a straight line, the defender will be forced to play behind the post player. This allows the trigger to make a simple, undefended pass into the low post which is the #1 option from the trigger spot. If the post defender chooses to front or half-front the low post, they’ve been ‘deployed’. With smart passing, this should always result in a high-percentage scoring opportunity for the low post. If the defender half-fronts from the high side, the trigger passes to the corner and then the corner passes inside. If the defender half-fronts from the low side, the trigger passes to the top and the top passes inside. As you can see, if you’ve got a smart low post player, this can be a fantastic offense to run which will result in them getting a lot of great scoring opportunities close to the rim. 1. The low post player’s ability to recognize that their defender is ‘deployed’ and being able to quickly adjust their positioning to take advantage of it. 2. The perimeter players being able to quickly recognize the post defender is ‘deployed’ and being able to make the correct pass that will give the low post player the best advantage inside. It’s impossible to write a great triangle offense article without a section dedicated to the spacing of the players on the floor. Without great spacing, the offense has very little chance of being effective. If players are in the correct triangle offense positions, they should always be 15 – 18 feet away from each other depending on the age group and size of the court. Why 15 – 18 feet? At this distance, players are far enough away from each other that it’s incredibly difficult for the defense to trap an offensive player or disrupt a passing lane without giving up an open shot in the process. At the same time, the offensive players are close enough together that the basketball can be passed quickly and accurately. To teach the correct spacing to your players, I highly recommend investing in flat cones that you can place in the correct positions on the court. That way players will always know whether they’re in the right spots. As with all offenses, the triangle offense starts with getting everyone into the correct positions to run the offense. 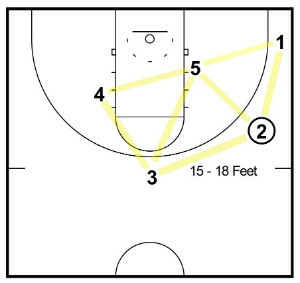 This means forming the sideline triangle and the two-man game on the weak side. There are many initial formations that you can use to enter into the offense (1-2-2, 1-3-1, 1-4, etc), but my favorite is the 2-2-1 formation. I prefer setting up from the 2-2-1 formation because a two-guard front allows for an extra player to pass to if the offense is having difficulty advancing the basketball up the court or provides an extra defender if the basketball is turned over. This extra player is crucial if you’re coaching a youth basketball or high school basketball team as these situations occur often. For that reason, in this article, I’ll be focusing on entries into the triangle offense out of the 2-2-1 formation. The inside cut is the most common and quickest entry into the triangle offense. It involves 1 making the pass to 2 and then cutting in-between 2 and 5 to the corner position. 5 slides over and establishes position high on the low block, 3 slides to the top of the key, and 4 moves close to the mid-post area on the weak side. In this entry, 1 cuts above 2 to the corner. This can be the best option if 2 catches the basketball closer to the three-point line than usual or if it looks like 2 can make the immediate pass down low to 5. 5 steps up and sets a up-screen at the ball-side elbow area. 1 passes to 2 and then makes a UCLA cut looking for the pass and layup. If the pass isn’t available, 1 clears out to the corner and the 5 slides back down to the low post. 3 slides to the top of the key and 4 moves to the mid-post area. For this entry, 1 dribbles down to the trigger spot and becomes the trigger. This pushes the player that was filling this position (2) down to the corner spot. This can be an effective entry if your lead guard is struggling to make the pass to the wing. The weakside entry is a great variation to confuse the defense or if the lead guard is struggling to make the pass to the wing. It involves 1 reversing the basketball to 3 and then 4 stepping out and receiving the pass at the trigger spot. 3 cuts through to the corner, 1 fills the top of the key, the player initially in the ball-side trigger spot (2) becomes the opposite, and 5 slides over and establishes low post position. In this variation, when 1 makes the pass to 2, 5 pops out to the corner. From this position, you can send either the lead guard, trail, or opposite to the low post position. For this example, we’ll show the lead guard (1) cutting and establishing position on the low block. 3 slides to the top of the key and 4 moves to the mid-post position on the weak side. This is a great variation if you’ve got a post player who can play effectively on the perimeter, if you’ve got a mismatch at another position, or if you want to drag the post’s defender away from the rim. This entry involves the 5 screening across for 4 as they switch positions. This often opens up a quick pass inside from 2 to 4 as they cut to establish position on the low block. 1 fills the corner with outside cut, 3 moves to the top of the key, and the player who was in the post (5) now becomes the opposite and holds their position on the weak side mid-post. As you can see, there are an unlimited amount of entries into the initial triangle offense set. Feel free to come up with your own that suit your team’s strengths! Choose 2 or 3 of the above entries that best suit your coaching style and the team’s personnel while putting players in different positions to succeed. This will allow your players to enter into the offense using a variety of different movements while not overwhelming them with too many options. Once your team has filled the correct triangle offense positions, it’s time to discuss how to run the offense and the different options available out of the offensive structure. a. The Sideline Triangle – Formed by the corner, trigger, and post. b. The Two-Man Game – Formed by the trail and opposite. The most important thing to know about the sideline triangle is that the pass from the ‘trigger’ position will dictate the next movements by all players on the floor. From the trigger position, there are 4 passing options that all lead to a different series of actions. The trigger must read the defense and make the smartest pass to initiate the offense. The first option that 2 must look at is whether they can make a direct pass to 5 in the post. Providing that the trigger and low post are lined up with the rim (line of deployment), this is often a simple pass with little chance of turning the basketball over unless another defender is helping to prevent it. Refer to the ‘Line of Deployment’ section of this blog post to understand what to do when the low post defender is overplaying or denying this pass. When this pass is made, unless 5 is in position for a quick score, 1 must immediately cut along the baseline looking to receive a quick pass that can lead to a reverse layup. If they don’t receive the basketball, they cut out to the opposite wing. 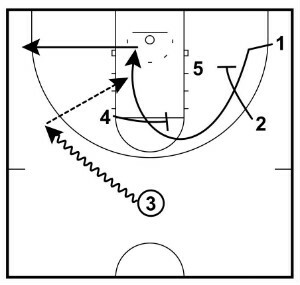 A second later, 2 cuts above 5 and sets a screen on the 4’s defender. This allows 4 to cut to the high post and will often leave them open for the free-throw line jumper. After screening, 2 clears out to the weak side corner. Both of these actions keep the weakside defense busy and allow the post player to back down in the post and finish with a post move if they feel they have an advantage. If none of those options result in an open shot, the basketball can be passed out to 3 at the top or can be skip passed to 1 in the trigger spot. The offense then sets back up and runs the offense again. Another option out of the pass into the post is called ‘post split’. 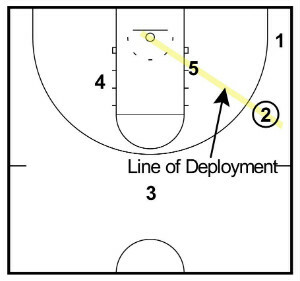 Post split involves 1 setting a quick up screen for 2 who cuts baseline looking for the pass and layup before cutting out to the weak-side wing. 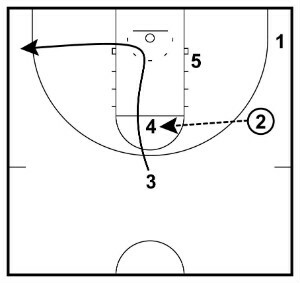 A second later, the 1 cuts above 5 and sets a screen on the 4’s defender. (This option is simply reversing the roles of both players from the original option). The reverse pass to the top of the key leads to a two-man game on the opposite side of the floor. This has many fantastic options that you can take advantage of depending on the personnel on your team. I’ll cover these option in the ‘two-man game’ section in part ‘B’ below. The third passing option for the trigger is to pass to is to the corner. When 1 receives the basketball, the first thing they must look at is whether 5 has established good low post position and if there’s space for a pass inside and score. If not, the 5 will step out and set a back screen for 2 who cuts to the rim looking for the basketball and an open layup. If 2 doesn’t receive the basketball, they cut out to the weakside corner. 5 immediately transitions from setting a back screen for the trigger spot to setting an on-ball screen for 1 who will dribble up before receiving the screen to create more space. This two-man game can be incredibly effective as the ball-side of the court has been cleared out and the help defense will hesitate to rotate off the weakside mid-post or leave a player wide open on the opposite side of the court. For the weakside flash option to be effective, this player in the opposite position must be constantly reading the positions of the other players on the floor. When this occurs, it’s a great opportunity for the opposite to flash, receive the basketball, and then make the quick pass inside to 5 who has sealed off the defender with correct footwork. Even if they don’t receive the basketball, by flashing to the basketball when the post defender is fronting, there will be no help defense on the opposite side of the floor and 2 can make the lob pass to the low post. If 3’s defender is denying the pass from the trigger spot, this is a great opportunity for ‘blind pig’ action. This involves 4 flashing to the basketball, receiving the pass, and then dropping the pass off to 3 as they quickly backdoor cut towards the rim for the open layup catching their defender out of position. 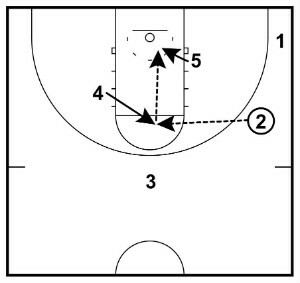 If 3 doesn’t receive the pass they clear out to the corner. After 3 has cut through, 4 can look to face up their opponent and attack the rim if they have an advantage. As soon as the pass is made to 4, 1 sets up their defender by walking towards the key and then cuts to the top off a down screen from 2. If the immediate shot off the down screen is open, 4 passes to 1 for the shot. If not, 1 will perform a dribble weave with 4 and receive the basketball off a quick dribble pitch or a hand-off. This is a great opportunity to curl and attack the rim, pull up for a midrange shot, or drive the basketball and finish or pass to 3 or 5 for easy scoring opportunities. If there’s no attacking opportunity, 1 can dribble to the trigger spot on the wing and the players can set up the triangle offense to be run again. The two-man game is often referred to as ‘pinch post series’ to many coaches. There are many, many variations out of this two-man setup that can lead to many great scoring opportunities. My recommendation is to select 2 or 3 of the variations provided below that best suit the personnel on your team and give you a variety of options. The first option is for 3 to make a pass inside to 4 who has stepped up the high post. After making the pass, the 3 will immediately cut off the high post looking for the quick bounce pass or hand-off leading to a layup. 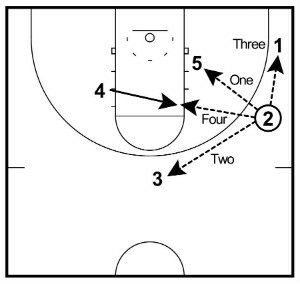 If 3 doesn’t receive the pass, they clear out to the corner. From here, 4 can face up and attack the basket if they have an advantage against their opponent. If they don’t have an advantage, 4 completes a hand-off or dribble weave with 1 who will be cutting around up the top off a down screen from 2. This will often lead to 1 getting an open midrange or three-point shot, a drive in for an open layup, or a pass to either 3 or 5 on the drive to the hoop. If attacking isn’t an option, 1 dribbles out to the trigger spot and the players all adjust positions to get to the start of the triangle offense once again. The next option you have out of pinch post is an on-ball screen. As the pick-and-roll is one of my most effective offensive weapons in basketball, this option is one I highly recommend is used by all teams at the youth and high school level. 4 steps up and sets an immediate on-ball screen when 3 catches the basketball. Since the entire side of the floor will be open, this is a great opportunity for a midrange pull-up or a drive to the rim. After screening, 4 stays at the top of the key as safety since 5’s already in the key and it would become too congested to make a pass and finish around the rim. If the weakside post defender helps across, it will lead to a bounce pass and layup for 5. 2 sets the down screen for 1 to cut to the top of the key to keep the defenders on the weak side occupied. Note: This is the same sequence as weak side entry. This pinch post variation allows the players to set back up to the initial formation and run the offense again. This can be a good option for teams who don’t play in a league with a shot clock and there’s a less-skilled player in the opposite position. 4 steps out and receives the pass from the top of the key. 3 immediately cuts to the ball-side corner and 1 will fill the position at the top of the key after cutting off 1’s down screen. 5 slides across the key and establishes position in the low post while 2 fills opposite. If you have a player in the opposite position with the ability to dribble the basketball and create for others, the ‘post pop on-ball screen’ can be a very effective variation. 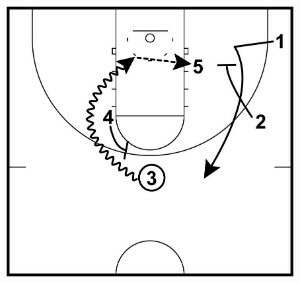 This involves 4 stepping out and receiving the pass from 3 at the top of the key. Instead of cutting through to the ball-side corner, 3 immediately sets an on-ball screen for 4 to attack the rim. 1 will cut to the top of the key off the down screen from 2 which provides a passing option as well as a bounce pass to 5 if their defender steps across to help on the drive. The next variation is a good option if you’ve got a highly skilled and high-IQ player at the 1 position. Instead of making the pass into the high post, 3 dribbles straight to the trigger spot on the wing. This signals for 4 to set a screen at the top for 1 who will be curling around the top of the key off 2’s down screen. If 1’s defender trails the screen, 1 can curl and cut to the basket looking for the pass and open layup. If they don’t receive the basketball, 1 will clear out to the corner. If 1’s defender goes under the screen, 1 can step back and receive the pass for the outside shot. If 1 receives the pass and the shot isn’t open, they will dribble to the wing and push 3 down to the corner position while they fill the trigger spot. 5 slides across and establishes low post position, 4 steps out and fills the top of the key, and 2 moves to the weak side mid-post area so that the team is back in position to start the offense again. There is a mindset among the basketball community that the triangle offense is too complicated for any non-professional team to run. I disagree with this and hope that this article shows you that while it can be complicated with many actions and counters, it can also be executed simply and effectively with fewer offensive options. If you think your team has what it takes and you’re willing to commit long-term to teaching it and practicing with your players, I highly recommend implementing the triangle offense.